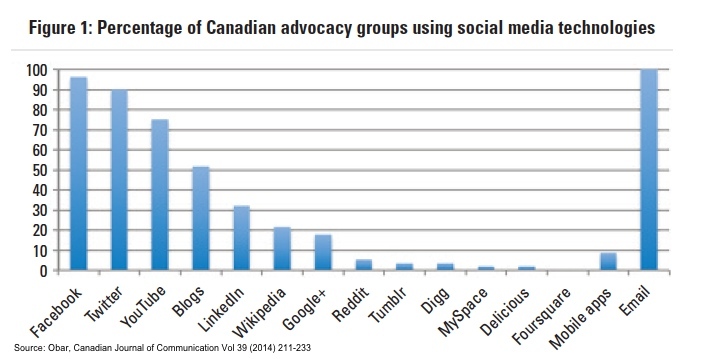 You might think that advocacy groups would be the most enthusiastic adopters of social media. After all, social technologies are tailor-made for relationship-driven groups; they harness loyalty and amplify messages. They help smaller organizations do a lot more than their organizational resources would normally allow. But surveys from a number of years ago suggested that Canadian-based NGOs were slow to enter the world of Facebook, Twitter, LinkedIn, and the like. And today? These organizations, according to Jonathan A. Obar (U Toronto/Michigan State U), have largely made the leap, yet they are still hobbled by a number of hurdles. Fifty-four of 56 groups use social media to interact with the public (the outliers: the Fur Institute of Canada and the Louis Even Institute for Social Justice). Most groups use Facebook (54 of 56) and Twitter (50 of 56). YouTube is also popular (75%) as are blogs (52%). Fifty-two percent use Facebook every day; 30 percent use it a few times a week. Fifty-seven percent use Twitter every day and an additional 22 percent tweet a few times a week. Of the remaining technologies, blogs are used most often, with five of 56 groups blogging every day and an additional 11 blogging a few times a week. Most groups use YouTube a few times a month. All 56 organizations send emails to the general public (Feminist Majority Foundation sends emails to 170,000 individuals a few times a week). The majority of groups send emails a few times a week or less, with only three of 56 sending emails once a day or more. Email and Facebook were the preferred methods of communication for most tasks. Regardless of Facebook’s ranking, Twitter almost always followed, and blogs were usually the next most popular. Google+ ranked last in all categories. In his interviews with NGO leaders, Obar found that advocacy groups still see some drawbacks in using social media. For one thing, Facebook, Twitter, and their ilk require a considerable commitment of staff time and resources, and there is a steep learning curve in using social media properly. Some groups told Obar that they remain unconvinced that social media are effective tools for advocacy. One anonymous NGO manager claimed social media provide “basic recognition, nothing more. A ‘like’ button does not help us in any way.” Another noted, “Social media allows us to create a base movement, but [it] has also created a substantial class of ‘slacktivists’ who … can never truly be nurtured into real activists.” Obar says some groups believe social media may create a false sense of a movement’s reach and influence. “Qualitative results addressing perceived social media affordances suggest that while groups are enthusiastic about social media’s potential to strengthen outreach efforts, enable engaging feedback loops, and increase the speed of communication, they remain cautious of unproven techniques that may divert resources from strategies known to work,” he wrote in the Canadian Journal of Communication. It’s worth noting that Canadian activists appear to be laggards in this area. 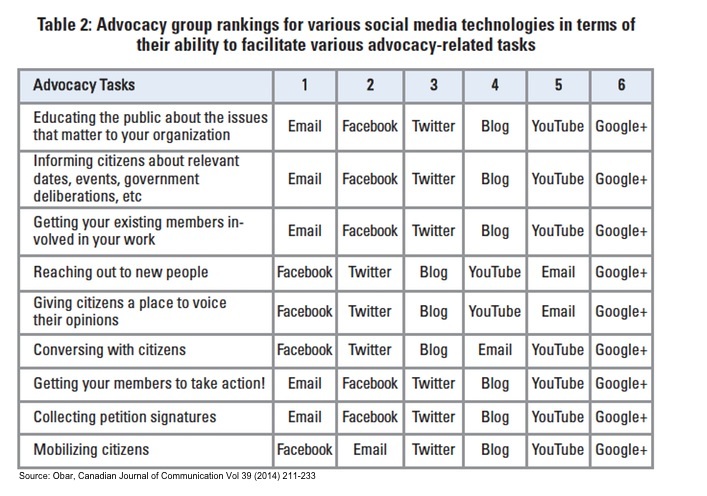 Obar was part of a team that conducted a similar survey in 2012 of 53 advocacy groups in the U.S. All the U.S. advocacy groups surveyed use social media technologies to communicate almost every day. It will be interesting to compare these results to findings a year from now, i.e., a year after the Canadian anti-spam law went into effect.